Debt is a hallmark of modern life. Even the most financially responsible of individuals will carry at least a token sum of debt for one reason or another, typically a small credit card balance. And, of course, there is the ubiquitous home mortgage, a form of debt so prevalent in these United States that even the stingiest of anti-borrowing financial gurus acknowledge its place in the American experience. Few people have the money on hand to make so large a purchase when the need arises, and lenders are more than happy to bridge that gap. But there exist other forms of debt which tend to manifest in more toxic fashion where the borrower’s fiscal wellbeing is concerned. Student loans, for instance, are nightmarishly pervasive and will oftentimes burden a person for years and decades after they have closed their last textbook and cleaned out their proverbial lockers. Student debt is a very real problem. High-interest rate credit card debt is another pestilence within the world of personal finance. This is a complicated subject and one that has as much to do with lifestyle choices as it does anything else, but the pertinent point remains: Credit card debt has a tendency to overwhelm the borrower. Expenses mount, interest accumulates, and the payments are due each month. Before one knows it, a relatively small clothing purchase has surpassed its original dollar amount thrice over courtesy of relentless and indifferent interest. Many debts are unavoidable, even perfectly justifiable. Foremost among these are debts brought on by unexpected medical bills or expenses resulting from severe emergencies. Many a savings account has been depleted by such crises, often with the effect being that individuals who might otherwise be averse to relying credit…end up relying on credit. The specific cause of one’s accumulated debts aside, there are programs in place designed to help those at risk of succumbing to financial distress. These programs consolidate debt and calibrate manageable interest rates for the debtor’s benefit. Before moving forward with a program of that sort, it’s best you understand the pros and cons of debt consolidation. Consolidation of numerous loans can be both advantageous and extremely sensible for borrowers over their heads in monthly payments, fees, and soaring interest rates. But these programs are not without their potential drawbacks. If structured shrewdly and combined with disciplined spending on part of the borrower, they offer tremendous upside. But absent one or both of those elements, the consolidation might amount to little more than a rearranging of loan balances. 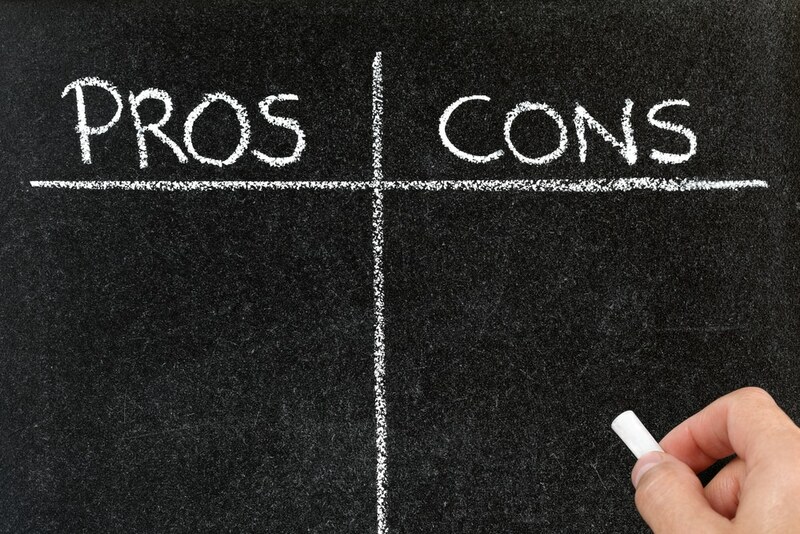 Simply put, the pros and cons of loan consolidation merit close attention. Let’s begin with the cons. One unfortunate aspect of debt consolidation is its reliably negative impact on the borrower’s credit score. Though seeking out assistance of the sort debt consolidation can offer would seem to be a responsible decision, it is regarded as a red flag by credit bureaus. This may be of little concern for debtors whose credit is already in poor repair, but for those hoping to keep good standing in that regard, it could prove too large a drawback. A short-term benefit of debt consolidation is that of reduced monthly payments, with the resulting downside being a longer-term loan. Something to bear in mind if you had planned on quickly eliminating debts. When considering the pros and cons of debt consolidation loans, bear in mind that many debt consolidation programs require the borrower put up something in the way of collateral, often a major asset. The risk therein speaks for itself. For many borrowers, the promise of reducing their monthly bills from several to, say, one is hugely attractive. This aspect of loan consolidation largely reduces the risk of missing payments or losing track of which lender is owed what amount each month. Debt consolidation programs will often reorganize a debtor’s overall obligations in such a way as to reduce the monthly amount owed. This often creates vital breathing room for individuals struggling with essential expenses. A particularly ugly aspect of the debtor/lender complex is that of fees/penalties. Many loans or credit cards burden the borrower with additional charges for one purpose or another. A single fee here or there may be negligible, but as they grow in number, the ensuing financial pain is all too real. A debt consolidation program will do away with the fees, allowing their clients to focus on paying down the loan balance. There is much to recommend a credible debt consolidation program, but potential clients should closely evaluate the offered solution(s) prior to signing on. There are, after all, both pros and cons to be weighed.